Programs for Tots together with parents, grandparents and/or caregivers provide your child a chance to experience the wonders of a special play group with enjoyable, creative, interactive, social and nurturing activities. Tots have an opportunity to investigate a multitude of new adventures, develop motor and cognitive skills while enjoying music, play and activities. Creative Play provides a wonderful and exciting first school experience. For 90 minutes children actively engage in creative and age appropriate activities in our stimulating and nurturing learning environment. The morning is filled with music, circle and story time, combined with kinder-gym activities and is a stepping stone to Adath Israel Nursery School. Enjoyable, creative, interactive and nurturing morning program. We offer both a 2 day and 1 day programs, suitable for tots 16 months – 3 years. The Sportsball program provides a special engagement that allows parents/caregivers to have a direct hand in supporting their toddler and preschooler’s development during a unique 45 minute multi-sport program. With the active support and participation of their grown-up, children can refine their skills and continue their social and physical development such as balance and coordination by participating in eight popular sports, hockey, soccer, football, baseball, basketball, volleyball, golf and tennis. We offer 45 minute programs for 3 different age groups: 16 mos – 2 years, 2 – 3 ½ years, 3-5 years. This is a fun filled 45 minutes of songs, games, puppets, musical instruments and dancing, all to the accompaniment of the guitar. All ages are welcome. Grandparents, parents, and/or caregivers are invited to our fun interactive Shabbat Class with L’Dance! 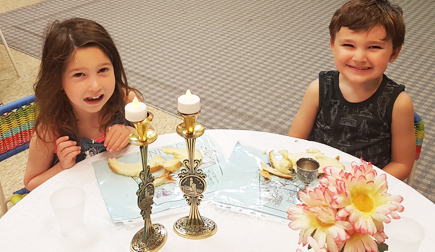 Our program focuses on welcoming Shabbat and upcoming Jewish holidays through movement, music, props and story-time.